There were some pretty bad storms blowing through this area Tuesday afternoon. In fact there was a tornado that did some damage in Beavercreek about 18 miles away. Thankfully there was no tornado here but the wind was pretty rough for a little while and it rained like crazy for a bit. The tent held well. 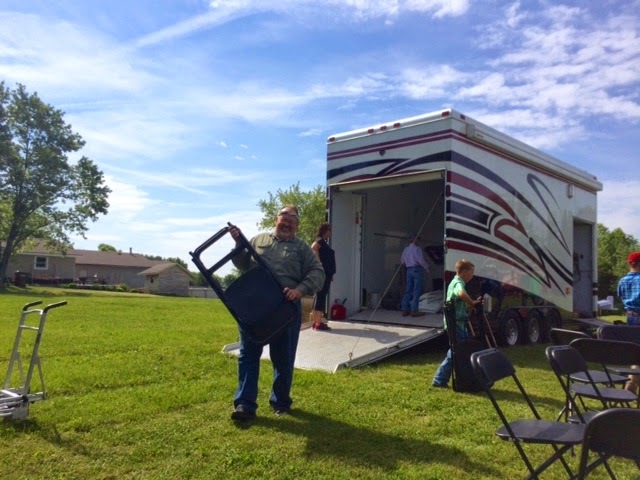 We had a space of clear weather right before church time so I decided to set up the sound system about 6:45 and have an abbreviated worship service and get straight to the preaching. 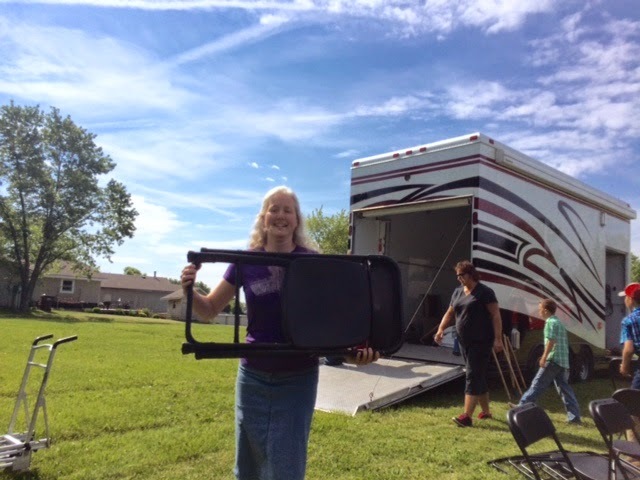 By the time we were ready to begin at 7:00 the rain was pouring down in bucket loads. We went ahead and started by faith and in a few minutes it was clear. I turned the service to Bro. Jimmy Millikin pretty quickly and they sang and preached wonderfully. God used him again to speak to several folks and we had a great altar service and prayer line. 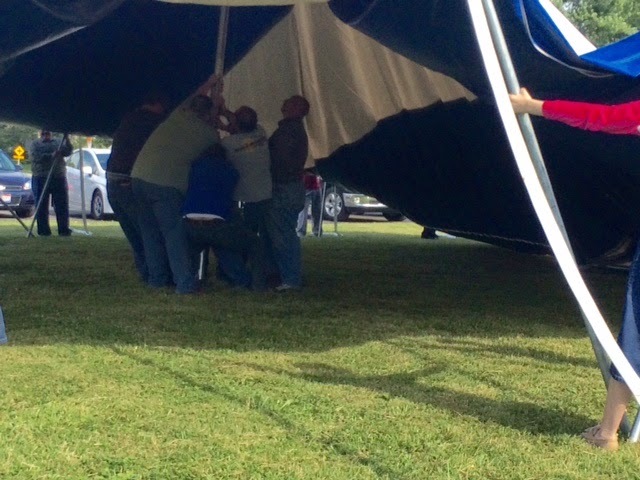 We could have had church inside but I am so glad we were able to meet under the tent again. It seems that anticipation is building with each service and I can hardly wait to see what the Lord is going to do in peoples lives the next few night. Thank you for praying for us. After church the sky was beautiful. 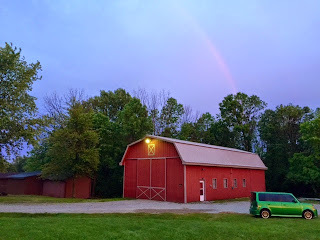 The sun was setting over the tent and a rainbow was shining over the barn. It was incredible. 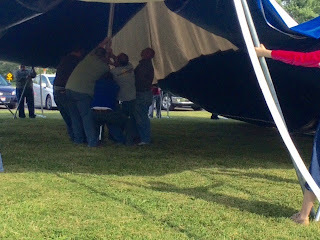 Here are the promised pictures from Saturday when we set up the Blue and White Gospel Tent. We had a big crew and the set up went really, really smooth. 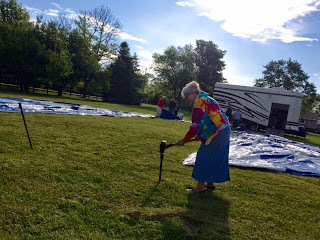 While Tommy was finishing washing the tent, Dad and I laid out the stake line and then put the stakes in place to be driven Saturday morning. Dad could not resist the temptation to drive one stake. I think he did resist the temptation to drive another one! Here are Odie's pictures from the tent set up. Mom even drove a stake in the ground! This is most of the hardworking crew. I sure appreciate all of the hard work. Thanks for stopping in. I hope you enjoy the pictures.